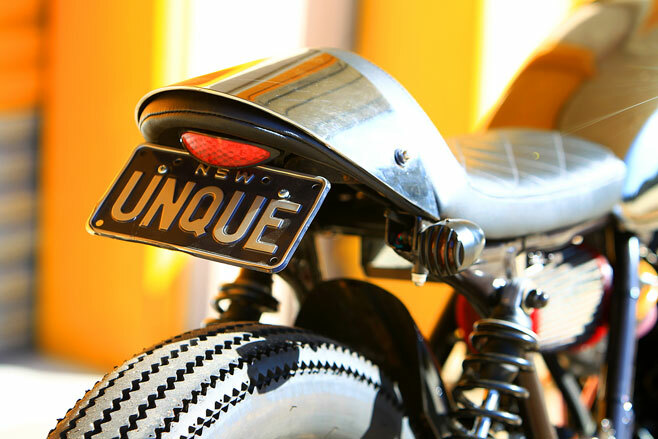 The simple little single-cylinder motorcycle makes a perfect blank canvas for a custom cool project due to its simple design. 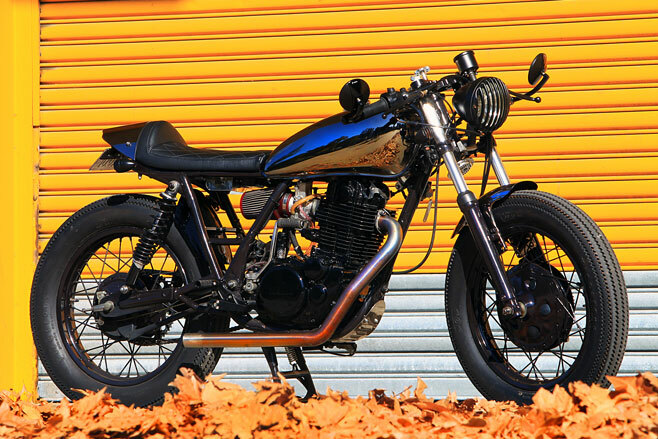 Jason Gasoline has built a number of SR400-based projects, naming all of them to reflect their personality. Tomahawk I and Tomahawk II are just two of his well-known projects, but his latest custom creation, which we featured in Vol 64, No 25, has a darker personality. It’s been christened La Sombra, a Spanish word meaning The Shadow. Its centrepiece is a shiny black-pearl petrol tank, tail and front guard. “I think every bike needs a character: there’s no point building something unless it has a character right from the beginning,” Jason said. Looking over the bike in its newly finished condition it’s easy to see he is very satisfied with the result. “We were over the moon with the final result and this motorbike has turned out better than we ever imagined it would,” Jason said. Jason said riding the rebuilt SR400 custom café racer is like riding a brand-new Yamaha SR fitted with a performance-built engine. “It’s surprisingly comfortable for a custom bike and would easily handle long or short trips,” he said. The inspiration to build La Sombra came from one of Jason’s customers, Michale Kriesch, who approached Jason last year with the idea to build the dream custom café racer he had always wanted to own. Kriesch had a particular style in mind and worked with Jason to design the dark-mirror styling of La Sombra. La Sombra is based on a 1986 Yamaha SR400. The little single-cylinder motorcycle has been in constant production in Japan since 1978, barely changing during that time – it still retains a kick-start. Though not officially sold in Australia until 2014, pre-2014 grey imports are in good supply, along with the SR500, manufactured between 1978-1999, which was sold in Australia. The 1986 SR400 used for Jason’s custom build features drum brakes front and rear. “Normally, we do a disc-brake front-end conversion when working with an SR400 of this vintage but we wanted to keep this one original,” Jason said. “The SR400 is a great little bike to work from as a base if you want to do a café racer-type build. The 399cc, air-cooled, single-cylinder, SOHC, two-valve-per-cylinder engine in La Sombra has been fitted with a 38mm Mikuni carburettor and manifold as well as a new piston to increase compression ratio to 10:1. The cylinder head and cylinder were given a makeover with the valves and valve seats machined. The engine was also blueprinted. The exhaust system may look like just a straight-through pipe, but a baffle has been fitted to the system to reduce the noise – it still sounds meaty but loses the headache-inducing bark of a straight-through system. The frame was taken back to bare metal and powdercoated and the engine was given a full blacked-out treatment. The original tank was retained to keep the standard SR400 look. The original front fork and both wheels have also been powdercoated and the rear shocks have been replaced with Ikon shocks manufactured by Australian company Ikon Suspension. Another interesting touch is the military-style light and indicator covers. During the war, motorcycles were fitted with similar covers to minimise peripheral light. The build process took three month, with the black chrome finish on the petrol tank, tail and front guard a complicated process. The donor bike was stripped down to the bare frame before the build process even got under way. “The unique colour is called Black Pearl; it’s applied using a chrome sequence with dipping,” Jason said. “It’s quite a process to get it what you see here – it’s like a nickel-plate process, as opposed to a zinc or chrome plating. Jason said La Sombra was the most typical café racer-style motorcycle you were ever likely to ride. “Having to use the kickstart to get it going is all part of the experience,” he said. Fitting the high-compression piston and head has given the little 399cc engine a little extra squirt and Jason even reported the drum brakes are more than up to the task of stopping the bike.